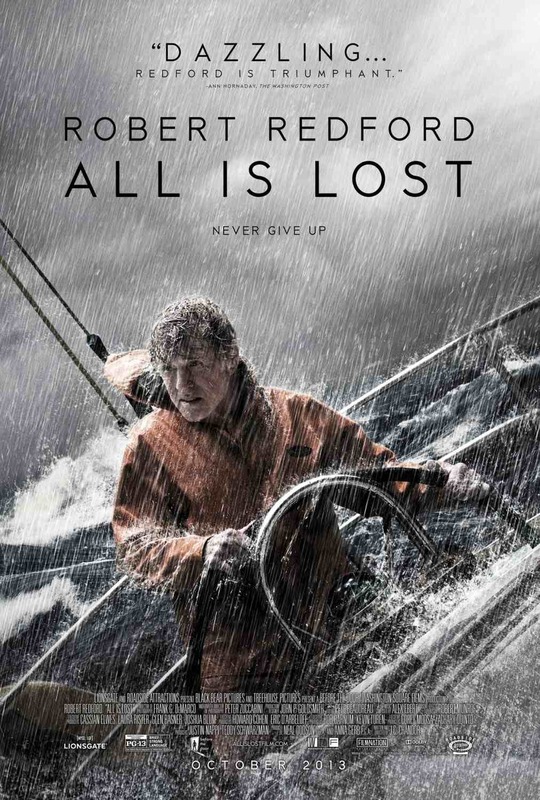 “All Is Lost” has nothing to do with the Obama Administration. It’s the latest Robert Redford (“The Company You Keep”) vehicle, and this time it’s a boat. This movie is the brainchild of Writer/Director J.C. Chandor (“Margin Call”), and for some reason he needed the 77-year-old Redford to pull it off. Our Man wakes up at sea to find his 33-ft. sailboat has been rammed by a rogue shipping container. We don’t know his name, and the credits list him as “Our Man,” but I will call him Redford. Once he and I do a movie together I will get to call him Bobby. The movie starts with the immediate problem of waking up to a hole in the boat out in the open sea. For you budding screenwriters, this is how it is done. You could write 30 pages about his wife wishing him well, and him having problems at work, or why he was taking this voyage, but a good producer will toss that right out. This movie can also teach you a lot about writing dialogue. Did I mention he was alone? Just him, a top-of-the-line life raft and a yacht full of food and supplies. And his life raft did not have a crouching tiger hiding in it. He also had a fiberglass repair kit and did a decent job repairing the hull damage. But his luck did not hold out. I don’t want to give anything away, but things got worse. He handles each challenge like the seasoned sailor he appears to be. He is prepared for adversity and handles most of what happens by the book. Now, I love Redford, the man and the character, Our Man. So my issues must be with Writer/Director Chandor. I was expecting to see a good 45 minutes of Redford just coming apart on the screen. I wanted to see him go through all the emotions and desperation of a man in his position, and Chandor only scratched the surface. He had a Ferarri in Redford, but did not want to open it up. Sure there were a few moments, but nothing like what you saw Tom Hanks go through in “Cast Away” or “Captain Phillips” for that matter. I love the idea of this movie, as a thriller and even more as a metaphor. A guy in his latter years is alone on a vast sea, and then his life starts “taking on water.” He repairs the wound and tries to go on, but that scar will always be a weak spot for him. And we have the irony of a very independent person out on his own who will only survive if others come to his rescue. The movie is shot well. Although it keeps you interested, the movie never rises above the basic story. A rich guy has a bad day on his boat. They made a movie about it, and it could have been so much better. I can only give it 2 stars out of 5. I wanted an epic struggle for life and they gave me “The Old Man and the Sea” in a bigger boat.